I have a formalized process refined through working with hundreds of clients across the globe. It’s solid and stable. Here’s how I go about it. Assess and finalize requirements, confirm project. Project initiation—setup configuration and initiating work. Make mobile-friendly & issue final review. Move to production, configure & make ready for launch. Who are you targeting? Knowing the target market sets us up for the challenge. What is your goal in the next 6, 12 months with the website? A longer-term perspective of our goals will help set a firm foundation to the project. How does this project solve the business challenges. Pursuant to this I formalize a clear plan and strategy that will help client achieve the business goals. This includes technical requirements, deadlines and will account for any other variables. I’ll then present you with the work and cost estimates via a formal quote. I’ll schedule a Skype call so that we can go over the quote and confirm the project. Upon project confirmation I’ll queue it up in my schedule and inform you of the date when the work will start. This is mostly in the same week. Upon initiation you’ll receive a mail with a development URL and information that work has begun. I’ll keep you informed at every step about what’s happening on my front. Here’s my development setup checklist. It does not have 51 points to cover that it becomes impractical and useless. But it’s enough to account for all pitfalls. I tend to take a very different approach when it comes to reviews. Typically clients and other professionals aim for 3 reviews to finalize the work. But I have hard time limiting myself to 3 reviews. I like to aim for perfection and justify everything before I’m really happy with the work. Even if I get a go ahead, I could come up with suggestions on how to make it better, more robust and just perfect. While this has its pitfalls, it does help me take great pride in my work. Making the site mobile-friendly and responsive is the last step in coding. If you do this earlier then other changes will break the responsiveness. There will be duplication of effort and re-inventing the wheel. Not only that, it makes the work dirty. Once I have the final site that is cross-browser tested and is production ready, I’ll implement responsive design, test it and make sure that it has a seamless user-experience across all browsers, screen-sizes and devices. There are several things to check before the website is ready for delivery. In a development environment the setup is optimized for development. When it has to go live, it should be optimized for production (think speed and performance). On the development server, the site is un-cached so that any changes are immediately visible. This is to avoid frustration clearing browser cache or server cache while testing etc. And before the site is even ready for production I have a checklist to ensure that nothing gets missed. During the development there are cases wherein I have to use placeholder text and images. Though my designs are tested and content-proof I still do a manual check to see the actual content and images sit perfectly as they are supposed to. I do several other checks like for the presence of a favicon, functioning of contact forms etc. Here’s the website pre-delivery checklist. I don’t press the go-live button though—that’s not my place. Moving to production requires that a known-good backup of the development site be made and the same restored on the production server. At this stage I need to access the production server. I’d at least need the FTP and a sql database before I can initiate the move. At other times cpanel or shell access is perfect and more that what I ask for. While making the site production ready, I make sure that the WordPress user profile is using the client’s email address. Verification for Google Search Console and Bing Webmaster Tools is done in this phase. 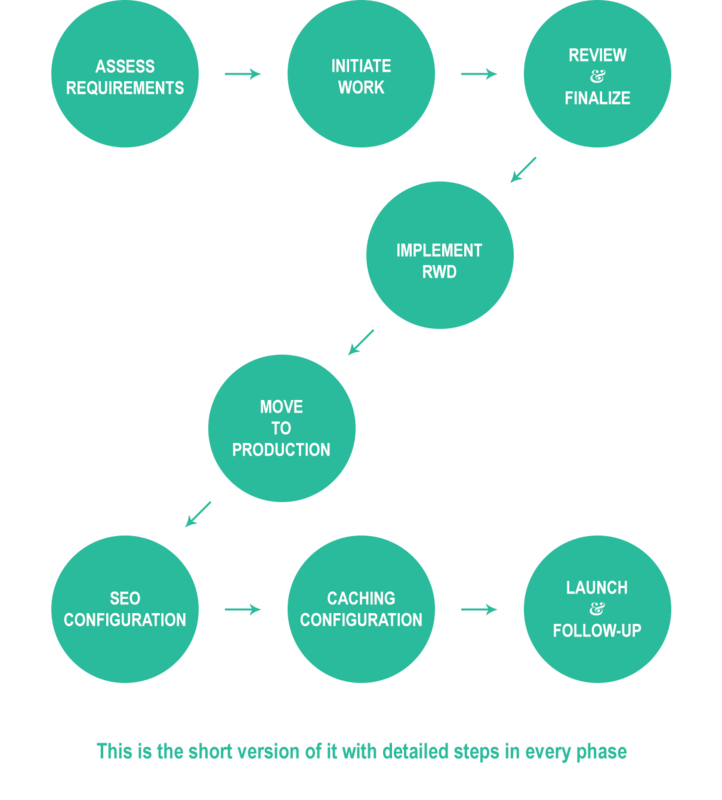 Here’s the my checklist for making the site launch-ready. I always follow-up with the client to see if everything works as expected. I’m open to changes & tweaks—idea is “solving the problem”. I’ll also inform you of the free support period. I’ll set a reminder in my calendar for the same. For the purpose of security I’ll ask you to revoke my access and change the credentials. This serves a twin purpose— a) Your site is secure b) I’m secure. I’ll then send you a request for a small MOT survey, perhaps seek permission to showcase the project in my portfolio may be even a testimonial. But all this after I’ve done my every last bit to deliver at “wow” levels.